If you have a student with disabilities, the process of helping your child transition out of high school into post-secondary education or employment requires some thoughtful measures. 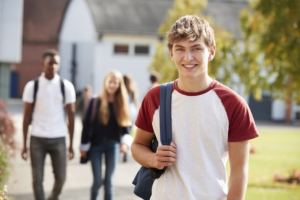 Parents and other family members are key to a successful transition, and most high schools have a dedicated transition support specialist who can help as well. The Massachusetts Rehabilitation Commission (MRC) also offers pre-employment transition services to students ages 14-22 with a documented disability who are enrolled in high school or post-secondary education/training. The goal of these services is to help students with disabilities explore and prepare for post-secondary employment and education options through five core services. Create a “vision” for your student’s future based on his or her interests and dreams. Begin developing a realistic vision for the future during the teen years. And then make sure that the goals, objectives, and strategies on the student’s Individualized Education Program (IEP) support the student’s vision for the future. The vision is a starting point and can be re-visited over time. Create a person-centered planning team that can help your student prepare for the future. A person-centered planning team should include the student, you (and other family members), teachers, and caregivers. The team should meet regularly to identify opportunities for the student. Make sure that your student plays an active role in planning for the future to whatever extent possible. Students can learn valuable communication and self-advocacy skills by being a part of the planning process. Think about future employment. Whether a job will provide financial support, personal fulfillment, social opportunities, or some combination of these, it is a very important component of adult life. Students should begin early in high school to explore career opportunities, develop pre-employment skills (interviewing, soft skills, etc. ), and identify training needs and goals. Start promoting independence early. Allow your student as much independence as possible and assign responsibility for tackling transition goals, either for college planning or for employment. Provide opportunities to make choices and decisions, to explore and take risks, and to learn from the experiences of success and failure. Teach money management and banking skills, which will be beneficial regardless of whether your student goes to college or starts working right after high school. This includes managing his or her own Attainable account. Explore all college disability services if your student is continuing into higher education. These can help ease academic challenges and level the playing field. Finally, students with disabilities must learn how to make informed decisions about whether or not to disclose their disability in new settings. These decisions will affect their educational experience, employment, and social lives. Disclosure is a very personal decision, so respect your student’s wishes. As you and your student prepare for life after high school, your help is invaluable. Making this decision, as well as all others, together as a team will make the transition as smooth as possible.